The brain - the front part of the Central nervous system, located in the cavity of the skull. Consists of hemispheres and brain stem with the cerebellum. The brain is divided into five sections: 1) the medulla (myelencephalon, or medulla oblongata); 2) back of the brain (metencephalon), consisting of a bridge (saralieva) and the cerebellum; 3) the average brain (mesencephalon)where the legs of the brain and Chetvorkata; 4) the intermediate brain (diencephalon), consisting of visual hill (thalamus), natsuhara, hypothalamus and zabugorie; 5) final brain (telencephalon), or large hemisphere. Just as in the spinal cord (see), in the brain there are gray and white matter. From gray matter - clusters of nerve cells in the brain formed the nucleus and the cerebral cortex and cerebellum. The white material is bunches of long and short of nerve fibers that connects the various entities of the brain with the spinal cord. In the brain stem are clusters of nerve cells with numerous short fiber - mesh education (formatio reticularis). The medulla is the direct continuation of the spinal cord. In the nuclei of medulla oblongata originate important cranial nerves (language-pharyngeal, wandering, incremental, and sublingual). Pass through the pathways that conduct impulses from the spinal cord to the brain (centripetal) and from the brain to the spinal cord (centrifugal). One important way is the pyramid on the way, connecting the motor area of the cerebral cortex motor cells of the anterior horns of the spinal cord. On the border oblong and spinal cord is the intersection of the pyramidal tract, resulting in functional impairment in damages of a particular area of the brain. With the defeat of the pyramid of the beam above the intersection developed hemiplegia (see) on the opposite side of the body; if both are affected craniocerebral nerves, their function is broken on the side of the body, the same lesion (see Alternating syndromes). Bridge brain also contains cranial nerve nuclei - trigeminal, discharge, facial and state-acoustic (predverno-cochlear). Through the medulla and the bridge are regulation of blood pressure and respiration and such reflexes as chewing, swallowing, vomiting, coughing, sneezing, blinking. The junction of the bridge, oblong brain and cerebellum called cerebellopontine angle. It is located at the base of the brain in the posterior cranial fossa. In this area on the surface of the brain out of the front and state-acoustic nerves. When tumors in the cerebellopontine angle crushed coming departments medulla, Pons and cerebellum and develop relevant clinical symptoms. The composition of the mid-brain includes Chetvorkata and the legs of the brain. Chetvorkata is located on the dorsal surface of the mid-brain. Front mounds of cetverokatnice are the primary visual centers, and back - hearing. In her legs brain are red kernel and the black substance involved in the regulation of plastic tone of the muscles of the body, and at the bottom of the brain (selview) water - kernel oculomotor and block cranial nerves. Through the legs of the brain are ascending path that carry impulses to the vision behind and a big hemispheres, and descending pathways that conduct impulses to oblong and spinal cord. In the midbrain are also net substance (see above). Main education intermediate brain - visual hillocks, which is the reservoir of all sensitive ways (except olfactory), passing to a large brain, the hypothalamus (see the Hypothalamus), geniculate body with subcortical visual and auditory centers and the pineal gland , together with formations. In each Department brain has cavity - the ventricles of the brain. Ascending upward, the Central canal of the spinal cord, expands and moves in the fourth ventricle, the bottom of which is a diamond-shaped hole formed by the oblong brain and by a bridge. In the thickness of the bottom IV heart are the cranial nerve nuclei (from V to XII pairs). On the fourth ventricle is the cerebellum (see). Outside fourth ventricle limited legs of the cerebellum, top - vascular plate, top and bottom brain sail. Up fourth ventricle and tapering in the area of the middle brain goes into the brain (selview) water, surrounded by gray matter. Cerebral aqueduct at the top becomes the third ventricle - cavity intermediate brain. Lateral wall of the third ventricle are visual hillocks; top - epithelial plate (the roof of the third ventricle), which is the arch and corpus callosum of the big hemispheres of the brain; the front - the front spike and columns of the code. Between the columns of the code and the forefoot of the corpus callosum is the transparent partition. The bottom of the third ventricle is the hypothalamus: the final album, optic chiasm, funnel, pituitary, gray mound, solvenia body. The cavity of the third ventricle is connected by means of interventricular holes with lateral ventricles of the big hemispheres. In the lateral ventricles distinguish the front, back and bottom of the horns of the lateral ventricles. Just as in the IV and III ventricles, they are the choroid plexus. Choroid plexus produce cerebrospinal fluid (see), which fill the ventricles of the brain and the Central cavity of the spinal canal. Through the holes on the bottom of brain sails cerebrospinal fluid comes from the cavity of the fourth ventricle in Podporina space (see mater) and also washes and external surfaces of the brain and spinal cord. In violation of patency of these holes, as well as in case of compression of cerebral aqueduct tumor can develop occlusive hydrocephalus (see). The final brain is divided longitudinal cut into two hemispheres, interconnected calloused body, roof and front spike. Corpus callosum is a powerful beam of fibers connecting the cerebral hemispheres. The arch front is divided into columns, and the back legs. Between the legs of the code lies spike vault. Speakers of the code sent to solovinye body, from the inner core which originates beam, going to the optic hill. Hemispheres are divided into the frontal, parietal, temporal, and occipital lobe and the island. The surface of the cerebral hemispheres of the brain - the cloak (pallium) - cut furrows between which lie gyrus. Most deep lateral (selview) furrow separates the temple from the frontal and parietal. Deep in the lateral grooves is an island. Part of the frontal and parietal lobes on the lateral sulcus called a Central tire. The frontal and parietal lobes separated from each other Central (nalandaway) furrow. Around the Central furrows are precentral.net and postcentral gyrus. In the frontal lobe there are two or three frontal furrows, the lower its surface cut orbital and olfactory sulcus. On the last lies olfactory tract. Parietal share is divided into lower and upper segments, it cuts through magemena furrow. On the inner surface of the occipital lobe are sporna and parietal-occipital furrows. Between them is the so-called wedge. On the inner surface of the hemisphere are furrow of the corpus callosum and the traditional furrow between them lies cingulate gyrus, which is part of the limbic region. Under the gray matter of the hemispheres of the brain cortex - lying white substance and basal core. White substance consisting of fibres, forms the outer and inner bags. In bark end of a brain there is a representation of the various functions (cortical centers). According to the teaching of I. P. Pavlov, the bark is a natural end analyzers. In the occipital region presents visual analyzer, in the hearing, in postcentral - General sensitivity, precentral.net musculoskeletal analyzer. The limbic region is related to vegetative functions. Areas such as frontal, lower parietal, temporal-parietal-occipital subregion, refer to mezhanalizatornym zones engaged in higher mental, speech and thin purposeful movements of hands. Fig. 1. 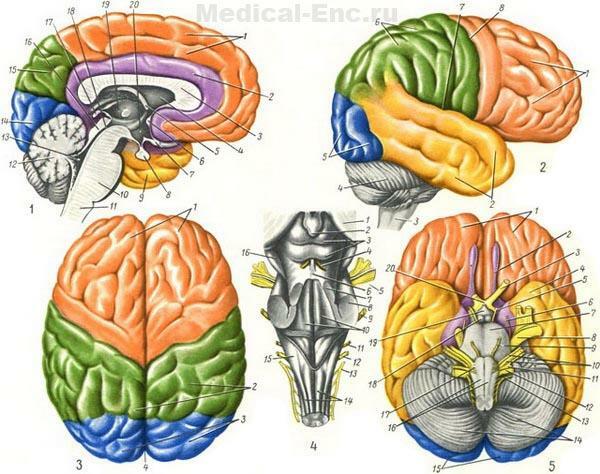 Sagittal section of the brain: 1 - the frontal lobe hemisphere; 2 - cingulate gyrus; 3 - corpus callosum; 4 - transparent barrier; 5 - REDD; 6 - front spike; 7 - optic chiasm; 8 - pituitary; 9 - temporal lobe hemisphere; 10 - bridge; 11 - the medulla; 12 - the cerebellum; 13 - fourth ventricle; 14 - occipital lobe hemisphere; 15 - parietal share hemisphere; 16 - Chetvorkata; 17 - the pineal gland; 18 - cerebral aqueduct; 19 - visual mound; 20 - podporna region. Fig. 2. The brain. Side view: 1 - the frontal lobe; 2 - the temporal lobe; 3 - the medulla; 4 - the cerebellum; 5 - occipital lobe; b - parietal share; 7 - lateral groove; 8 - Central sulcus. Fig. 3. The brain. Top view: 1 - frontal lobe hemispheres; 2 - parietal lobe hemispheres; 3 - occipital lobe hemispheres; 4 - a longitudinal slot brain. Fig. 4. The brain stem. Top view: 1-optic hill; 2 - the pineal gland; 3 - Chetvorkata; 4 - block nerve; 5 -trigeminal nerve; 6 - top brain sail; 7-top leg cerebellum; 8 - middle leg of the cerebellum; 9 - facial nerve; 10 - diamond shaped hole; 11 - language-glotocnogo nerves; 12 - the vagus nerve; 13 - additional nerve; 14 - the medulla; 15 - bottom leg of the cerebellum; 16 - foot cord. Fig. 5. The base of the brain: 1 - frontal lobe hemisphere; 2 - olfactory tract; 3 - the optic nerve; 4-temporal lobe hemisphere; 5 - oculomotor nerve; 6 - block nerve; 7-bridge; 8 - trigeminal nerve; 9 - lateral nerve; 10 - facial and predverno-cochlear nerves; 11 - language-glotocnogo nerves; 12 - the vagus nerve; 13 - additional nerve; 14 - the cerebellum; 15 - occipital lobe hemisphere; 16 - the pyramids of the medulla oblongata; 17 - hypoglossal nerve; 18 - mastoid body; 19 - gray mound and funnel; 20 - optic chiasm.